For more than a decade, researchers have been trying to create accurate computer models of Escherichia coli (E. coli), a bacterium that makes headlines for its varied roles in food poisoning, drug manufacture and biological research. By combining laboratory data with recently completed genetic databases, researchers can craft digital colonies of organisms that mimic, and even predict, some behaviors of living cells to an accuracy of about 75 percent. Now, NSF-supported researchers at the University of California at San Diego have created a computer model that accurately predicts how E. coli metabolic systems adapt and evolve when the bacteria are placed under environmental constraints. Bernhard Palsson, Rafael Ibarra (now at GenVault Corporation in Carlsbad, California) and Jeremy Edwards (now at the University of Delaware at Newark) report their findings in the November 14 issue of Nature. "Ours is the only existing genome-scale model of E. coli," says Palsson. In addition, while many approaches to genetics experiments "knock out" individual genes and track the results, the new model takes a whole-system approach. Changing one aspect of a genetic code could be irrelevant if an organism adapts and evolves, says Palsson. The constraints-based models allow the E. coli to evolve more naturally along several possible paths. Scientists may use the approach to design new bacterial strains on the computer by controlling environmental parameters and predicting how microorganisms adapt over time. Then, by recreating the environment in a laboratory, researchers may be able to coax living bacteria into evolving into the new strain. The resulting strains may be more efficient at producing insulin or cancer-fighting drugs than existing bacterial colonies engineered by researchers using standard techniques. "Now we have a better tool to predict how bacteria evolve and adapt to changes," says National Science Foundation program director Fred Heineken. "As a result, this constraints-based approach could lead to better custom-built organisms," he says. The researchers based their digital bacteria on earlier laboratory studies and E. coli genome sequences, detailed genetic codes that have been augmented with experimental information about the function of every gene. Such digital models are known as "in silico" experiments -- a play on words referring to biological studies conducted on a computer. In the first days of testing on living organisms, the bacteria did not adapt into the strain predicted by the simulation. 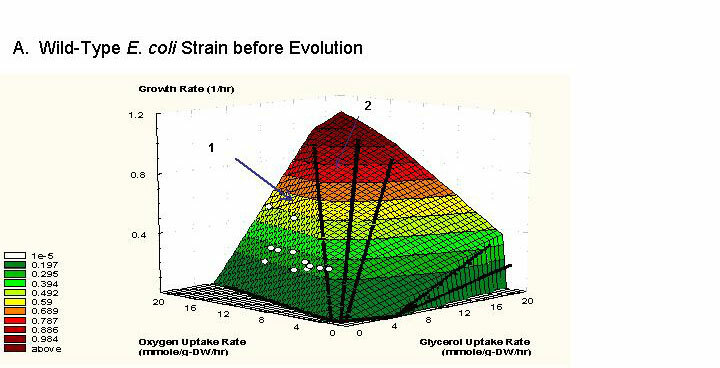 Yet, with more time (40 days, or 500-1000 generations), the E. coli growing in the laboratory flasks adapted and evolved into a strain like the one the in silico model predicted. "The novelty of the constraints-based approach is that it accounts for changes in cellular properties over time," says Palsson. "Fortunately," he adds, "the other advantage is that it actually works surprisingly often." For many years, drug manufacturers have manipulated the genetic code in E. coli strains, creating species that can produce important substances, such as the hormone insulin for use by people with diabetes or the experimental cancer drug angiostatin. 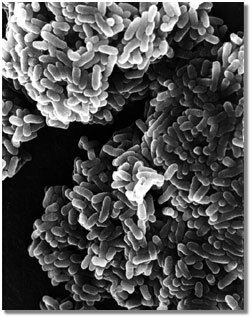 Using the new constraints-based techniques Palsson and his colleagues developed, drug manufacturers and bioprocessing companies could use computers to determine the genetic code that could yield the most efficient and productive versions of E. coli, and then use adaptive evolution to create bacterial strains that have the desired properties. Says Palsson, "This development potentially opens up a revolutionary new direction in the design of new production strains." In addition, says Palsson, "now that we have gained a greater understanding of this process in E. coli, developing similar simulations of other organisms should take less time." The two images show how E. coli bacteria in a laboratory evolved over time to metabolize and grow at a rate predicted by a computer simulation. The bottom left axis represents the amount of oxygen that the bacteria consumed, the bottom right axis represents the amount of glycerol (the food) the bacteria consumed, and the vertical axis represents the rate at which the bacteria grew. The colored surfaces are called "phenotype phase planes." They graphically represent the researchers' in silico (computer) prediction for the possible ways in which the bacteria could grow under specific environmental conditions. 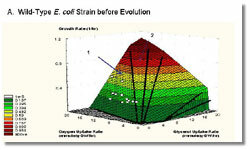 The red shading represents faster growth conditions, the green represents slower growth. The red line is the "line of optimality," the optimal growth rate predicted by the researchers' computer model. Region 1 represents a phase where growth is not optimal, Region 2 represents a phase where the bacteria consume too much food and therefore have to secrete some as byproducts of metabolism. The white dots are measurements of how several E. coli specimens were metabolizing food, and how fast they were growing when the researchers tested them. After 40 days (700 generations), the bacteria evolved to metabolize as predicted by the researchers' in silico model (all specimens cluster along the line of optimality). Photo Credit: Images courtesy of the Genetic Circuits Research Group (Rafael U. Ibarra, Jeremy S. Edwards, and Bernhard O. Palsson).